Two Indian teenagers are chasing an American dream as baseball professionals and their promoters hope they can stir up interest in the game in their cricket-mad homeland. 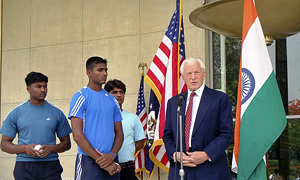 Rinku Singh, 18, and fellow javelin thrower Dinesh Patel began a year-long training stint in Los Angeles last week after winning an India-wide pitching contest, “The Million-Dollar Arm”. The boys, from poor families, used their natural shoulder strength to take the top two spots from among 8,000 participants. Another teenager, Manoj Shukla, will receive a month’s training after he came third of the 27 finalists. The winners, who were handed their visas in a ceremony at the US embassy in New Delhi, will get an opportunity to be assessed by professional baseball scouts at the end of their one-year stint. Their US-based promoters are hoping the youngsters can make it as professionals, saying such success would boost baseball in India in the same way that Yao Ming’s move to the NBA created a fan base for basketball in China. “Yao Ming has been a huge success in linking China and the USA in basketball and has created over 350 million new fans of the game in China over the past seven years he has played in the US,” Jeff Bernstein, managing director of 7 Figures Management, a sports marketing and management firm, told Reuters. “Our hope is that our contestants can duplicate that success in baseball, creating fans in India over time through following these Indian nationals in their baseball career in the USA,” he said in an e-mail response to questions. India, world cricket’s commercial hub, has become a big draw for other sports hoping to tap into its booming economy. Golf is taking giant strides and India staged its first European Tour events this year while soccer authorities are pushing to revive the game in the country. The Australian Football League (AFL) announced plans this month to push the game in India in their search for new markets. Singh, son of a truck driver from the northern state of Uttar Pradesh, won the first prize of $100,000 after pitching at 87 mph (140 kph) and being declared the most accurate. Patel was fastest overall at 89 mph (143 kph) but was second in accuracy while the 17-year-old Shukla topped 86 mph. Bernstein said he decided to test the throwing skills among Indian youngsters after watching a game of cricket. The left-handed Singh, who has hurled the javelin to a modest distance of 67 metres, is aware of the tough job on hand. Dipesh Solanki, an Indian coach doubling up as interpreter for the boys, said the prize money had been a big attraction. Although Major League Baseball (MLB) games are televised live in India, they do not attract the same interest as NBA games or Formula One races. Some baseball is played in the western state of Maharashtra, of which Mumbai is the capital, and an American club is promoting the game in the northeastern state of Manipur. Can a relationship counsellor figure out a failing marriage in 5 mins?